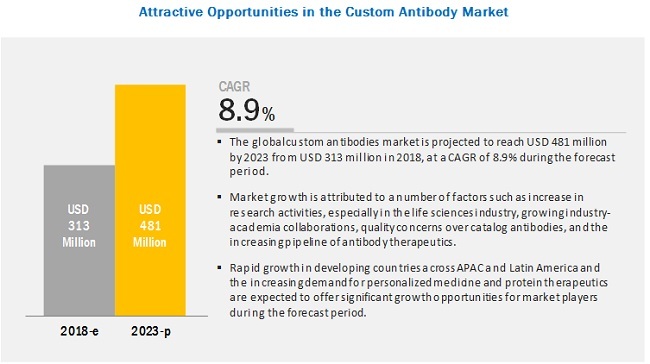 Custom Antibodies Market is expected to reach USD 481 million by 2023 from an estimated USD 313 million in 2018, at a CAGR of 8.9%. The major factors driving the growth of this market are an increase in research activity—especially in the life sciences industry—along with growing industry-academia collaborations are the primary growth drivers for this market. In addition, the objective behind custom antibody production is to acquire an antibody that performs well in a particular qualitative or quantitative immunodetection method. The quality of catalog antibodies (to ensure reproducibility of results) is also an area of concern in this market, which is primarily why end users prefer custom-made antibodies. Based on service, the custom antibody market is segmented into antibody development, antibody production & purification, and antibody fragmentation & labeling. The antibody development services segment is estimated to account for the largest market share in 2018. The large share of this segment can be attributed to the increasing focus of researchers on high-quality antibodies for reproducibility, which can be hampered by using commercially available antibodies. The antibody development segment is further subsegmented into antigen preparation, immunization & hybridoma production, and antibody characterization. Custom antibodies are categorized by type as monoclonal antibodies, polyclonal antibodies, recombinant antibodies, and other custom antibodies. The monoclonal antibodies segment is estimated to account for the largest market share in 2018. This is because monoclonal antibodies provide high specificity and selectivity and ease of production as compared to other antibodies, and are thus the preferred choice in all types of research studies. However, increasing recognition of recombinant antibodies as potential alternatives may hamper the growth of this segment to a certain extent.